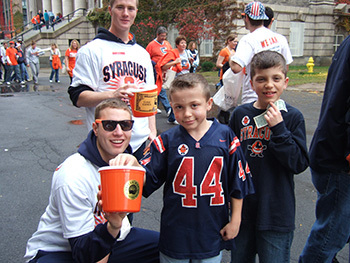 Fraternity members collect money during last year’s Dollar Day at the Dome. Before the Syracuse University football team kicks off against Wake Forest on Nov. 2 at 12:30 p.m., more than 200 student members of SU’s fraternities and sororities will be stationed at Carrier Dome entrances, on the Quad, in parking lots and across campus wearing bright orange caps and holding orange buckets, greeting fans and soliciting donations for the United Way of Central New York. In its 15th year, Dollar Day at the Dome is an annual fundraising event, a vital part of the University’s annual United Way campaign. Patrons who donate will be investing in the 95 local programs and services at 35 local agencies that benefit from the Central New York United Way. Celebrating more than three decades of support for the United Way of Central New York, Syracuse University launched its 2013 United Way campaign Oct. 8, distributing pledge cards to all employees and ushering in a new season of creative fundraising events across campus. The campaign runs through the end of the year. Dollar Day gives students an opportunity to participate in the University-wide campaign and raise funds for the community. Dean Diane Lyden Murphy of the David B. Falk College of Sport and Human Dynamics serves as chair of the 2013 campus campaign, and Dean Bea Gonzalez of University College as vice chair. The deans lead a cross-campus committee of more than 15 area chairpersons and 100 employee volunteers who help publicize the campaign and communicate the benefits of participation. The campus United Way campaign runs through the end of December. For more information on Dollar Day at the Dome, or the campus campaign, contact Northrup in the Office of Government and Community Relations, at 315-443-5303.